More white Millennials identify as “nones” than as Christians according to a post originally published in On Faith. “Nones”, you may remember, are those who check the “none” box when asked to state their religious affiliation. 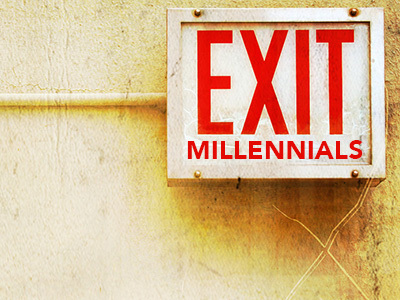 But there is no mass exodus afoot in the non-white Millennial segment of the American Church. As a result, although people of color comprise only one-third of American Millennials, they represent over half of Millennial Christians. Among Americans 65 and older, nearly 3 in 10 (29 percent) are evangelicals. That number drops to 1 in 10 for younger Americans. So, why are white Christians, conservative and liberal, in such a panic to leave the church while religious fervor among young people of color remains strong? This difference is particularly surprising when you realize that most African American and Latino Christians take the rough outline of their theology from white Christians. If you think non-white churches are bristling with liberation and civil rights theology you are mistaken. There are three large tribes within white American Christianity: mainline Protestant, evangelical Protestant, and Roman Catholic, and all three are hemorrhaging young people. Among white American evangelicals, Christianity largely overlaps with Republican political identification. Although it is rare to hear blatantly partisan political preaching in white evangelical churches, even in the American South, the association between Christianity and Republicanism is widely assumed. American evangelicalism loves Jesus and can’t pay him enough metaphysical compliments: Son of God, Lord of Lords, Coming King, etc. But American evangelicals have a problem with the core teaching of Jesus recorded in the Gospels. Jesus, to put it bluntly, makes liberal democrats look like Barry Goldwater. His gospel is “good news to the poor”. Jesus told his disciples to love everyone without reservation, to demolish us-them distinctions, to honor the dishonorable. Jesus loved and forgave his enemies, even while hanging in agony on the cross and, incredibly, insisted that his followers do the same. It was once possible to ignore the content of Jesus’ teaching. It didn’t get a lot of attention in sermons and Sunday school lessons and evangelical pastors evolved clever ways of explaining why Jesus almost never really meant what he said. That is changing. The radical shape of Jesus’ message is rapidly becoming public knowledge, forcing evangelical preachers and public theologians to ratchet up the machinery of denial. Older evangelicals can live with the disconnect between revelation and proclamation; but the cognitive dissonance is proving too much for “the information generation”. So, how do we explain the mass exodus of young people from the Protestant mainline and Roman Catholic churches of America? While American evangelicals are overwhelmingly conservative in political ideology, the nation’s white mainline and Roman Catholic churches are evenly divided between ideological conservatives and liberals, people who primarily disagree about money, poor people, and the proper response to the enemy and the “other”; precisely the stuff Jesus talks about in the Bible. Churches can’t wrestle openly with the alarming tenets Jesus-based morality without pouring oil on the polemical fire sizzling restlessly just beneath the surface of congregational life, so they ignore this stuff as much as possible. Sure, you hear vague references to justice, caring for the poor and feeding the hungry in many white churches, but the systemic roots of injustice, poverty and hunger are rarely explored. Here’s the big problem: You can’t apply the teaching of Jesus to the moral and public policy issues confronting American society without getting overtly political. But the politics of Jesus transcends the party programs of Democrats ad Republicans. The logic of Jesus-morality suggests a politics so radical and uncompromising that few elected officials in America would consider touching it. As a consequence, the moral content of biblical Christianity, properly understood, is irrelevant to American politics. Millennials love the Jesus portrayed in the Gospels and would love to learn more about them. But in the white Christian churches of America they are confronted with silence or bizarre misrepresentations of the Master’s intent. Are Christians of color more open to Jesus than their white counterparts? If your congregation is directly impacted by American immigration policy, the Bible takes on a surprising relevance. The Holy family was forced to live as refugees and illegal aliens. The Old Testament insists, repeatedly, that the sojourner and the resident alien must receive just and humane treatment. Jesus injunctions about “the least of these” take on a new relevance in a social context shaped by poverty and the constant threat of family separation, and this is true even if pulpit preaching is primarily about getting saved for heaven. The same dynamic is alive in the Black church. Only a small minority of Black churches participated in the civil rights movement, but that bold legacy has assumed a normative status in the Black church, even in churches where the preaching presents a Jesus who wants to make you rich. The Black Church is overtly political because bad public policy has had a devastating impact in poor communities of color. In short, there is just enough of the Jesus stuff in America’s Black and Latino churches to sustain the commitment of a restless Millennial generation. Many of these young people are frustrated by much of what they see and hear in church, but there is a dash of genuine Jesus-religion in the religious stew, and that keeps the young folks coming. Meanwhile, white American Christianity has a Jesus problem and it’s getting worse with each passing year. The flight of the Millennials is primarily a white problem. There’s something horribly wrong with white American spirituality and its driving our children to the exits. Jesus is our problem. Mercifully, Jesus is also the solution to our problem.